Montana fly fishing water we guide on. The fly fishing waters of Montana are some of the most legendary fly fishing waters in the world. 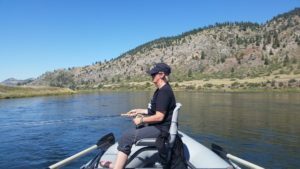 We fish the Bitterroot River, Blackfoot River, Clark Fork River, Missouri River and Madison Rivers. We have Most other unpermitted Montana Rivers on our operating plan and experienced guides to take you there. We are permitted by the United States Forest Service on five mountain streams in the Bitterroot Valley, The South Fork of Skalkaho, Sleeping Child Creek, Lost Horse Creek, Blodgett Creek, Mill Creek and Bear Creek and fish other unpermitted Montana streams. We have many lakes on our operation plan Gorge town, Clark Canyon, Browns, Bryant and many others. If there is a unpermitted water you want to fish that is not listed ask there is a good chance we have an experienced guide for you. The Bitterroot River» is our home river which meanders through the Bitterroot valley filled with fantastic scenery. It is bordered on the west by the rugged Bitterroot Mountains and on the east by the beautiful Sapphire Mountain range. The Bitterroot River including the East Fork Bitterroot and West Fork Bitterroot has over 100 miles of fishable water that supports a healthy population of wild West Slope Cutthroat, Rainbow, Brown, Brook Trout, and Mountain Whitefish. There are also Pike in the lower stretches. 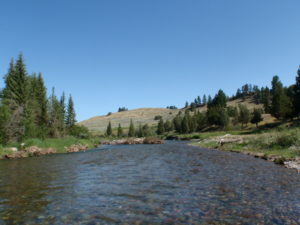 The Bitterroot River is a very diverse freestone river and is renowned for its dry fly fishing and many major aquatic insect hatches. This river differs greatly over its 100-mile journey. From the upper reaches of the West Fork of the Bitterroot River which is a tail water controlled by Painted Rocks Reservoir with its faster pocket water filled with riffles, runs and rock gardens, to the lower Bitterroot River with its deep holes, long runs, riffles and slow water. 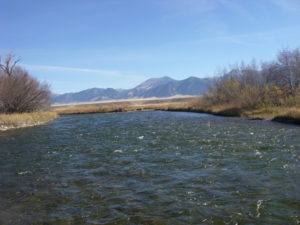 The Blackfoot River (from the movie A River Runs Through it) is one of Montana’s renowned "blue ribbon" trout streams. We fish the lower 64 miles of this river as the trout fishing can be spotty in the upper sections. The Blackfoot River is a free-flowing river, from its beginnings near the Continental Divide it flows 132 miles to its junction with the Clark Fork River. The Trout fishing is excellent and the scenery is spectacular. 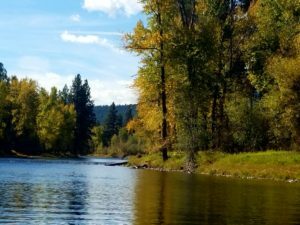 The Clark Fork River begins near Warm Springs and flows for 275 miles where it empties into Lake Pend Oreille. The Clark Fork River is notorious for its opportunity's to cast to "pods" of large rising Trout. Fishing for Trout on this river can be divided into two sections above and below Missoula. The upper section is one of Montana’s medium sized rivers Brown Trout are predominate here. The lower section (this is where the "pods" of Trout are found) has big riffles long slow runs and deep holes. For something different one might want to throw on a streamer and go for a big Northern Pike. The Missouri River is also known as the Mighty Mo. The Missouri River is a large, classic tailwater river, best described as a gigantic spring creek where the fish grow fast and big This River begins near the town of three forks Mt and is formed by the confluence of the Gallatin River, Jefferson River, and Madison River. There are many dams creating many lakes on this river. The thirty mile stretch from Holter Dam to the town of Cascade is the prime trout water and where most of the fly fishing takes place. The cold waters released by Holter dam provide prime trout habitat. The Madison River flows over 140 miles from its headwaters in Yellowstone National Park to its confluence with the Gallatin River and Jefferson River. We Trout fish thirty-seven miles of this upstream from the town of Ennis. The fifty-mile riffle as this section is sometimes called is a fast but gentle river. The Madison River offers exceptional Trout fishing in a beautiful setting. 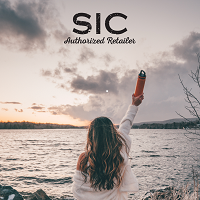 The Madison River flows down the middle of the gorgeous Madison Valley, bordered on the west by the Madison range with its gentle sloping conifer forest and on the east by the Gravelly range with its massive snow capped peaks. This entire section of river has countless riffles, runs and deep holes making this the best Trout fishing on the river. 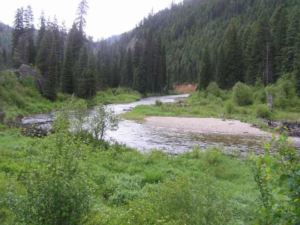 We have five Mountain streams for wade fishing on our forest service permit. Great for Tenkara the South Fork of Skalkaho, Sleeping Child Creek, Lost Horse Creek, Blodgett Creek, Mill Creek and Bear Creek and have other unpermitted Montana streams on our operating plan. If there is a Montana River or Stream you want to fish that is not listed ask we don't fish it we can recommend someone that does.